Part 1: What Is MOV? MOV conversion refers to the process of converting videos to/from MOV format, generally known as MOV transcoding or re-encoding. For example, it will convert MOV to MP4 to go beyond QuickTime and extend the uses across different platforms, or transcode video like WMV or AVI to MOV so that your QuickTime or iPhone will accept. Here's how to do so, using a MOV converter. Before we dive into MOV video converter section, let's have a look of MOV video format. MOV was originally developed by Apple.inc, as part of QuickTime technology. QuickTime File Format (short for QTFF) contains multiple tracks that store various types of data, e.g. video, audio, subtitles, images, etc, normally in .mov or .qt file extension, with the latter being relatively older than the former. MOV contains multiple tracks and subtitles. It uses MPEG-4 codec for compression that offers better quality files in relatively small size. MOV can be easily edited, without the hassle of rewriting, and played within browser like Firefox and Safari, if the QuickTime is installed. However, MOV won't be used outside QuickTime environment and codec is needed for playing or editing purposes. MOV is natively accepted by Mac QuickTime, iPhone, iPad, Apple TV, iTunes, iMovie and any others from Apple. Besides, Windows Media Player and VLC media player can open and play MOV videos, too. However, the MOV format may be conflict with Android or Linux based platforms and devices if required codecs like 3ivx are not installed. So you have to track down a MOV converter for Mac for the purpose. For playback purpose among Apple users: Apple makes things simpler by dispelling a raft of format alternatives like AVI, WMV, DivX, MKV, and more. It claims MOV as its default file format and makes MOV acceptable by Mac QuickTime, iTunes, iDevices, Apple TV, etc. As such, the best option is to make full use of a MOV converter for Mac to convert MOV from other files such as AVI, WMV, or so to if you are in Apple ecosystem. See the fixes when Quicktime won't play AVI. For editing purpose: The QTFF MOV features abstract data references and track edit lists. That means you are in full control of the audio and video contents of each file, make different transitions, add other extras, insert subtitles, etc without touching the track or changing the entire file, because they are stored on separated tracks. This makes it pretty easy to edit without having to rewrite all media data, whereas other container formats cannot do. Take a look below and convert videos to MOV format when you run up against the dilemmas. AVI is well compatible with Windows OS or apps like Windows Media Player, while it may be in conflict with Apple device that use MOV as its proprietary container. To convert AVI to MOV is essential to make AVI play on Mac or iDevices. MP4 holds videos with different codecs while QuickTime only accept H.264/MPEG4, AAC. So if the source MP4 is encoded with other codecs like MPEG4 Part 2, it may pose a codec problem. So a MOV converter is a must-have. DVDs are prone to scratch, damage or loss. Digitizing the physical matters and backup them onto Mac hard drive can save you from the disaster. To do so, you can rip DVD to MOV via a DVD ripper for Mac for easier storage and playback. You want to do some change of footages shot by your GoPro Hero. When you import the MTS files, they are not the Final Cut Pro editable format. Most users will resort to a MOV converter to transcode MTS to MOV that can be read by FCP. MKV is known for high image quality and multiple tracks. It is compatible with many blu ray players but runs into playback problem with iPhone and iPad. You have to convert MOV from MKV to enjoy them on these devices. There are some funny YouTube videos you saved on your Macbook. But these videos are in FLV format, whereas your iMovie supports MOV and MP4, except FLV. Thus, you have to convert them from YouTube to MOV beforehand. Both M4V and MOV are created by Apple, but the former is equipped with DRM protection to prevent against any spreading. You have to convert M4V to MOV in order to have all M4V videos recognized by QT, iTunes, iPhone, iPad, etc. MOV video format features seamless compatibility with Apple devices, high image quality, and easy editing, making it the first priority when converting videos. If you have the urgent need of converting videos to MOV for better playback on MacBook Air/Pro, QuickTime, iTunes, iPhone, iPad, Apple TV, etc, the top-end MacX Video Converter Pro will make any MOV conversion a reality. It is the fast MOV converter that encode any video into MOV at fast speed. With 370 codecs, the MOV video converter for Mac and Windows facilitates you with fast video conversion to MOV, be it MP4, WMV, AVI, MKV, AVCHD, MTS, FLV, H264 or WebM. 16X real-time faster and no quality loss. Despite MOV provides a seamless experience across all Apple devices, offers high quality image for storing and sharing digital information, combined multiple audio and video files separately, there are still cases you need to convert MOV to other formats. In terms of web streaming: QuickTime MOV format is in fact ideal for web transmission. It has the best video quality among the other two streaming formats RealVideo and WMV, however, isn't as widespread as MP4, WebM, and Flash, in consideration of both image quality and file size. So in case you need to share the MOV movie on YouTube or other sites, a MOV converter that can transcode MOV into MP4, FLV or WebM is a must. In terms of storage: MOV files are of high quality, but their size is bigger than many other formats like FLV, WMV, etc. In consideration of storage, many users will prone to compress MOV and shrink the size of MOV to other formats that occupies smaller space. In terms of compatibility: MOV exclusively belongs to Apple eco-chains. Even though the QuickTime File Format is cross platform and supported by Windows system as well, MOV is still less compatible with other platforms and devices. It will be problematic and is less useful for users working with Android, Linux, YouTube, to name a few. The easy way to remove the restriction is to convert MOV files to another file type that is widely accepted by mobiles, computers, game consoles, TVs, like MP4, AVI. Follow the guide below and convert videos from MOV to another file format to do more with the source content. MOV format doesn't achieve as widespread usage as AVI. It is a pain for users who are not under Apple's umbrella. The best way is to convert MOV to AVI format that has great support on Windows and other devices. Sometimes you'd like to extract the audio/soundtrack from the video to take with on an iPod or just for enjoying while you are strolling, if you have a pile of QuickTime videos. With MOV video converter to MP3, you can do the job easily. One of the strongest selling point of MP4 is its widest compatibility with other platforms. Whereas MOV files are practically unaccepted by Android, Game consoles, or so. So we need to convert MOV to MP4 to resolve the problem. If you're a Mac user who deals with video, you'll likely come across MOV videos and want to upload them to YouTube. But MOV is not accepted by YouTube. You must rely on a MOV converter to change MOV into YouTube recognized format first. Besides, there are still cases you need to convert MOV to other formats like MOV to WMV, MOV to MPEG, MOV to WebM, MOV to FLV, etc. There is no surprising more and more people are jumping into the online bandwagon, and MOV format conversion is no exception. You can rely on online MOV converter to deal with the transcoding of MOV video format. Alternatively, desktop MOV video converting software that runs on your Mac, Windows and Linux is also competent for the job. But what's the difference between the two MOV conversion methods? Which side will you take up with? 1. Easy to use and straightforward. 3. Support a wide range of input formats. 1. Convert one MOV video at a time, which is time-consuming. 2. Many online MOV video converters have no option to edit source file. 3. Limited Output options and low file size limit (Up to 100MB). 4. Conversion speed relies on stability/speed of internet connection. 5. Security hardzard and ads. 1. Support converting MOV files in batch. 2. No need any network to convert MOV files. 3. No restriction on the source video file. 4. Support a wide range of input and output formats. 5. Come with basic video editing features. 6. Safe and free from any ads, virus or malware. 1. Need to install software on Mac or PC. 2. Corresponding OS version is required. Anyway, if you stress on the conversion features, cleanness, MOV converting speed and put no emphasis on the software installation, the MOV converter software will definitely worth your trial compared with the online tools. There are dozens of MOV converter software that gets your files into MOV or convert your video files from MOV to be wrapped into MOV, AVI or other formats. Just take the following 5 factors into consideration, which are considered to reduce your burden of choosing the right MOV converting software. 1. The best video converter to MOV employs lossless compression algorithms to get rid of artifacts and output high image quality almost the same as original. 2. Good video converter app will be built in dozens or hundreds of codecs that cover your vast majority of conversion needs, not limited to MOV conversion. 3. High scores are given to the MOV video converter if it has a large library of profiles tailored to your needs, from smartphones, game consoles, tablets, to TVs. 4. You cannot emphasize too much the video converting speed. 5. The basic video editing features will be icing on the cake if you want to do more with the output content. Following the criteria, we happily find the software like MacX Video Converter Pro performs the best MOV video conversion. With 370+ video/audio codecs, the MOV converter can rewrap the video file into whatever format you need - you can convert MOV, MP4, AVI, WMV, MKV, MP4, AVCHD, MTS, WebM, FLV, and even H.265 to/from MOV format, thus getting your movies, TV shows, and recordings in order. Its library contains up to 400 profiles that makes a snap to transfer MOV or others directly to iPhone 7/Plus, iPad Pro, iTunes, QuickTime, Apple TV, Android, PSP, and more. This video converter for Mac even helps to compress video into smaller size if you have any storage issues. The time MacX Video Converter takes to complete the MOV conversion is stunning. It is able to convert a 60-minute video in as short as 5 minutes yet produces high-quality result compared with Handbrake or other competitors. This attributes to its advanced techs, e.g. advanced Intel QSV hardware encoder, hyper-threading technology, multi-core CPU, high quality engine and deinterlacing. 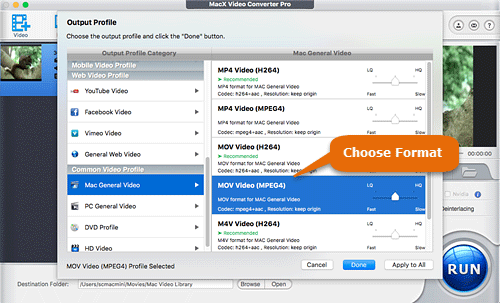 Take a look at how MacX Video Converter Pro outperforms other programs. Support HEVC, 4k/8k, supports YouTube, Facebook video, etc. Most popular video formats. No support for H.265. 400+ readymade profiles for latest devices, including iPhone 7, iPad Pro, etc. Offer general profiles for iPhone, iPad and web video. iPhone 7, iPad Pro, and other newly released devices are not supported. 200+ presets for mainstream devices. It's problematic and lengthy when converting some files like MKV. Get an error "This file isn't playable" when playing the MOV after conversion. You will be informed of no internet connection during MOV conversion. NO.1 fast video converter offers seamless MOV video conversion among MOV and MP4, AVI, WMV, MKV, etc and makes videos suitable for various screens (Macbook, iMac, iPhone, iPad, Apple TV, PSP, Android), without setting complex parameters. 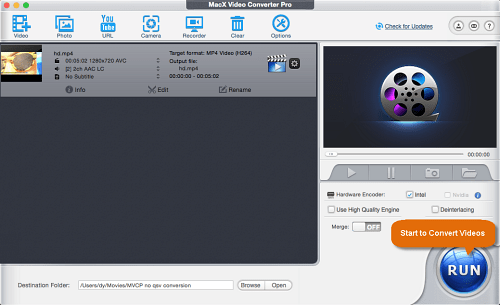 MacX Video Converter Pro offers an intuitive interface. It easy to use. You don't have to rush to an expert to perform the MOV converting task anymore. Just follow the 4 steps below with the MOV converter tutorial. Here we take convert AVI to MOV for playing on your QuickTime player as an example. Free download the MOV converter on macOS. The latest macOS High Sierra is well supported. Then launch the program. Click "+ Video" button on the main interface, where you can add the source AVI video file to convert to MOV format. You can add more than one file at a time. Once the output profile pops up, choose the output video format according to your needs. If you need to convert AVI to MOV on Mac, just go to the "Mac General Video", choose "MOV Video" as the target format on the output profile panel, and click "OK" to proceed. Optional: Prior to the MOV conversion, it's at your disposal to trim off unwanted parts, get rid of the black bars, add subtitles to the video, set the video bitrate, resolution, aspect ratio, etc as per your needs. Click "RUN" button to begin AVI to MOV video converting process, after which a video converting progress bar will pop up informing you of the detailed MOV conversion progress. Is MP4 or MOV better? Technically, MOV isn't in the Android supported format list. If you try to import MOV to Android for playing purpose, you will get a message "the audio format wasn't compatible". In order to play MOV on Android like Samsung Galaxy, you need to take advantages of a MOV converter that can convert MOV to Android supported formats like AVI first. This is conditional. If you are going to watch QuickTime MOV video on Apple TV, import the MOV movie to iTunes from the storage location on your Mac, then sync it with Apple TV. But if you need to stream MOV movies to smart TV like Samsung TV, you might be as well convert MOV to MP4 format and them enjoy a smooth playback on the TV from USB drive. MOV uses the lossy video compression algorithm to hold the video content. This approach gets rid of part of the video that is less important and avoids reencode degradation, thus making the video much smaller in size, yet managing to keep the maximal video quality after compression. MOV video format offers crisp image but takes up a lot of space, which is problematic if you are having a storage issue on your iPhone, iPad or sharing with others. But you can still rely on MacX MOV converter to compress MOV for much more smaller size, by either converting MOV to smaller-sized FLV, WMV, lowering the parameter settings like bitrate, resolution, aspect ratio, or trimming off the unwanted parts, getting rid of the ads, and more. Mac not playing QuickTime MOV. How to fix it? If the QuickTime player leaves no picture, no sound and black screen in front of you when playing MOV video on Macbook, iMac, you must be aware of the codec like AIC, ProRes that QuickTime won't accept and get new installation like Perian, VLC, Filp4Mac package, etc because new QuickTime is built on a different video/audio framework which doesn't support the older formats now. If these processes are complicated for you, simply resort to a MOV converter to do the conversion of MOV without changing the codecs at all. Windows Media Player can play almost all regular video format types. But there are times you cannot play QuickTime MOV on Windows platform, because of the unavailability of plug-ins or the codecs required to play MOV. But sometimes you can solve the error by using cross-platform codecs like Indeo or Cinepak or download the QuickTime player on your Windows computer. For a more powerful and easy solution, you are advised to try a MOV video converter to encode MOV into WMV or AVI that is more acceptable in Windows OS. How to repair a corrupted MOV file? When you are informed of a broken MOV file using VLC and it cannot read it, it is probably because the MOV video is corrupted. To repair the broken MOV file, you are there with 3 options: trim off the corrupted sections and save it into a new MOV file; repair the corrupt MOV file with VLC directly; or make full use of professional video repair software like Remo to get the broken MOV fixed. No.1 fast MOV video converter for Mac and Windows supports high-quality video conversion between MOV, MP4, M4V, AVI, MKV, WMV, WebM, FLV, MTS, AVCHD, and others and helps to play any video on iPhone, iPad, iTunes, Apple TV, Android, PSP, TV, etc with ease. Storing 4K is space occupation? Convert 4K as per your needs. For any questions with video converter for Mac, please feel free to contact our support team.